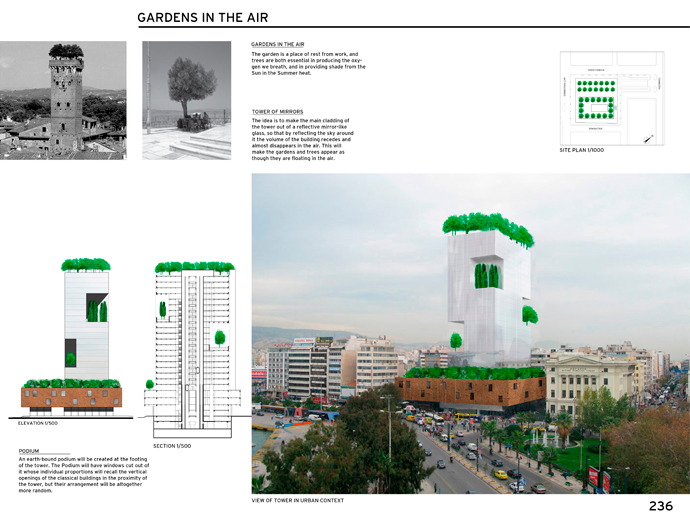 Robin Monotti Architects entered the Piraeus Tower Competition with a project called “Gardens in the Air”. 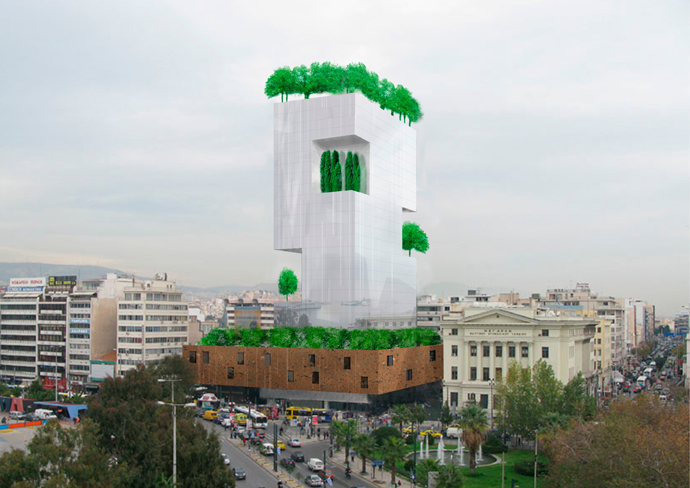 A number of gardens planted with trees are proposed throughout the verticality of the tower. Podium Garden – The first garden will be placed above the podium of the first three floors, this will be accessible by the public. Cut-out Gardens – Three further gardens are cut out of the edges of the tower, and serve their respective floors. In every location of the tower a garden will never be more than 5 floors distant. Roof Garden – A Garden planted with trees will be positioned on the roof of the tower, following the precedent of the Guinigi tower in Lucca, Italy. Tower of Mirrors– The idea is to make the main cladding of the tower out of a reflective mirror-like glass, so that by reflecting the sky around it the volume of the building recedes and almost disappears in the air. This will make the gardens and trees appear as though they are floating in the air. Podium – An earth-bound podium will be created at the footing of the tower. The Podium will have windows cut out of it whose individual proportions will recall the vertical openings of the classical buildings in the proximity of the tower, but their arrangement will be altogether more random.